Learning the ins and outs of English grammar can be quite difficult. However, one great way to learn how to use English grammar is to know the terms that are commonly used. This is where a grammar glossary can come in handy. Having an English grammar glossary gives you something to refer to when needed, and it will help you remember the different terms. You don’t need to know every single grammar term to have a good grasp of English. Although, having a basic knowledge of English grammar will help you to become more fluent. Verbs like ‘took’ and ‘gives’ are used in the active voice when the actual subject of the verb is the thing that is doing the action. The term active voice needs comparing with passive voice. An adjective in English is a word that is used to give you more information about something: ‘a pretty, green skirt’. An adverb in English is a word that will show more information about particular circumstances; information such as how, when and what. More often than not, adverbs end in the suffix ‘–ly’. 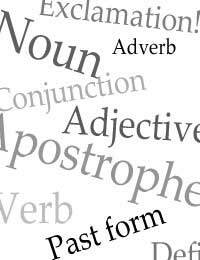 In English grammar, a conjunction is classed as a word that joins clauses together. Words like ‘and’, ‘but’ and ‘however’ are known as conjunctions. A contraction is when you use an apostrophe to replace missing letters in joined words: It’s (it is), don’t (do not), and haven’t (have not) are all contractions. The word ‘the’ is the definite article in English grammar. It is primarily used to restrict the meaning of a noun. It makes the noun refer to something that is already known by the reader, speaker or the writer. ‘The’ can also be used to refer to something that has already been spoken about, or to something that is about to be talked about. ‘She’s gone to the shop.’ In this sentence, the listener or the reader will know which shop she has gone to. An exclamation is a phrase or a singular word that expresses more emotion than normal. An exclamation mark is used to further express the emotion. There are only two indefinite articles in English grammar: ‘an’ and ‘a’. These indefinite articles are used before a singular noun that also has a plural form. You would use ‘a’ when placed before a consonant sound, and use ‘an’ when placed before a vowel sound. The sound is always more important than the actual spelling of the word as all letters can sound different when placed with other combinations of letters. A noun is a word in the English language that refers to places, people, things or ideas. Verbs such as ‘were taken’ and ‘was given’ are in the passive voice. This is because the subject of the verb is what has been affected by the action. The passive voice should be compared with the active voice. The past form is the form of a verb that usually ends in the suffix (-ed). In English, a verb is a word that is used with a particular subject. The verb will tell you what something does, what someone does, or what happens to them.